On 13 February 2019, Amcorp Group Berhad celebrated Chinese New Year with guests from Rumah Kasih Charity Home. A contribution of RM5,000 to Rumah Kasih Charity Home was made by Amcorp Properties Berhad (Amprop). 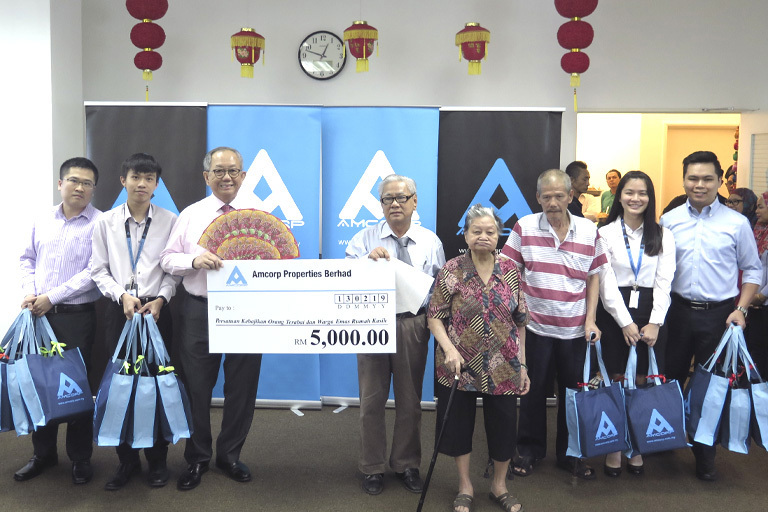 The cheque was presented by Amprop Director, Mr Soo Kim Wai, who also presented the Ang Pow and goody bags to Rumah Kasih Charity Home. The Home’s founder Mr Foong Peng Lam then gave a speech to express his heartfelt gratitude to Amprop for choosing Rumah Kasih Charity Home as its beneficiary. He explained that the contribution from Amprop is much needed to bear the day-to-day expenses for the basic needs of the residents. Amcorp Group Berhad had specially prepared various delicacies for the Chinese New Year Celebration which included “Lou Sang”, the prosperity toss. The members of Management of Amcorp Group Berhad led by Mr Soo Kim Wai and the guests from Rumah Kasih Charity Home did the “Prosperity Toss” together. The guests and staff were also entertained with a Lion Dance performance as well as singing performance by Mr Alfred Ho. Mr Alfred Ho is a talented, visually impaired performer. Mr Alfred Ho became blind at the age of three due to measles. However, it did not stop him from participating in various national and international singing competitions. Located in Setapak, Rumah Kasih Charity Home was established in September 2000. It offers free shelter, food and medical treatment for the discharged poor, old, homeless, and abandoned patients from Hospital Kuala Lumpur. Twenty elderly residents consisting of 15 males and 5 females are currently being taken care of by the home.